Surrey Historic Buildings Trust (SHBT) has announced the shortlist for the Surrey Heritage Awards 2017. The Awards have been created to celebrate Surrey’s rich and diverse architectural heritage, highlighting Best Practice in historic building conservation and restoration. St Martha’s Priory in Chilworth is a 1930s timber-framed Arts and Crafts house. It is a very fine example of the Surrey vernacular style but had been vacant for over 10 years and neglected. 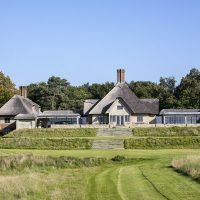 Now, with new owners, the challenge was to extend the house without detracting in any way from the original character of the building or disturbing the views from the North Downs Way and the medieval St Martha’s Church. Mullins Court, 58-60 West Street in Dorking was originally three of a terrace of four timber-framed houses dating from c.1589. In the 17th Century an impressive brick front was added. The building has been used as an antique shop but has now been converted back to three houses above ground-floor shops. The project has included repairing the timber frame and rebuilding chimneys using the original bricks. Great attention has been paid to using traditional materials. Hope Mausoleum in Dorking is a Greek Revival mausoleum built in 1818 for Thomas Hope, writer, art connoisseur and promoter of the neo-classical style. Following repeated vandalism, it was sealed up and buried in 1958. The project has restored the building, using the same materials and techniques that were used originally, and the newly-restored mausoleum is now open to the public on the Deepdene Trail. The Old Barn Motor House in Epsom dates from 1770 and is unusual in Surrey in having a pantile roof. Originally a barn and used for general storage for many years it has now been converted into a garage for a collection of historic vehicles. The conversion has been carried out sympathetically and rebuilding and repointing has been kept to a minimum, with care taken to retain the patina of age such as the slight irregularities of the roof. Undershaw in Hindhead was the home of Sherlock Holmes author Sir Arthur Conan Doyle between 1897 and 1907. It was commissioned by him as the family home because he believed the clean air of Hindhead would help his wife recover from tuberculosis. It was subsequently converted into a hotel but became derelict after the hotel closed in 2004. It is now owned by an educational foundation and has been repaired and restored to its original form including reinstatement of appropriate fireplaces. Home of Compassion in Thames Ditton is an 18th Century mansion in the Strawberry Hill Gothic style, built for the Hon. Charlotte Boyle Walsingham c.1786 and incorporating a library designed and decorated by the owner and her daughter. In 1905 the house was acquired by a community of Anglican nuns who renamed it the Home of Compassion and built the priory and chapel. It is now a nursing home but was unoccupied between 2008 and 2016 during which time theft and vandalism took their toll and extensive repair became necessary. The project has included the complete restoration of the library and its original panelling. The judging process is currently underway and the overall winner will be announced in a special ceremony on 29 March at Loseley Park, Guildford, hosted by Michael More-Molyneux, Lord-Lieutenant of Surrey and Patron of Surrey Historic Buildings Trust. Dame Helen Ghosh, Director-General of The National Trust, will be the guest speaker. For further information, or to join the Friends of Surrey Historic Buildings, please go to the websitewww.surreyhistoricbuildings.org.uk or email friends@surreyhistoricbuildings.org.uk. Pictured: St Martha’s Priory, Chilworth.